Get ready, Skylanders fans, the next new adventure for all your Skylanders toys will be out this fall. Activision just announced Skylanders Trap Team, a new game that introduces over 50 new characters (and associated toys) and a new type of gameplay. Now you'll not only be able to port your physical action figure into the virtual world to fight and win, but you'll also be able to pull virtual characters out of the game into the physical world and make them fight for you, too. In Trap Team, the story begins with villain Kaos finding and blowing up the Cloudcracker Prison, releasing over 40 baddies that were trapped inside. 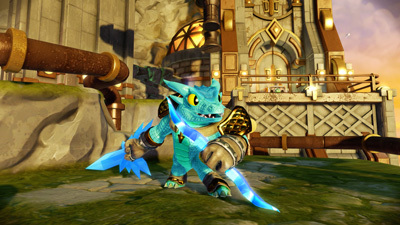 The prison is made of an in-game substance called Traptanium, and chunks of it (Traps) fall all over the world of Skylanders. The player's goal is to not only find and defeat the escaped villains, but to capture them once more inside of Traps. The virtual Traps connect to physical Trap toys in the real world. Each Trap aligns with one of the eight elements, and the baddie you capture must go in a Trap that matches their element (water to water, fire to fire, and so on). And when you capture a villain inside, you can hear them growling in frustration from the speaker of the (new for this game) Trap Portal. Though they complain, that doesn't stop players from using the baddies in fights. It's very similar to Pokemon where the creatures you catch then fight on your behalf. Not only will players need to acquire at least one Trap for every element, but each Trap can only hold one villain at a time. You'll still have to buy more stuff in the real world to add new characters to the line up. The new Trap Portal makes up for that a little since it adds a new dimension to gameplay. 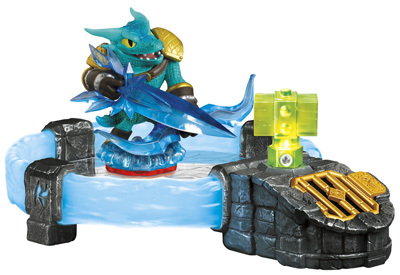 With it, you can now play using both a Skylanders toy and a Trap villain at the same time. Players can switch between the two at the tap of a button, similar to tag team play. In addition to playing as the escaped villains, Skylanders fans will have a choice of new characters, the Trap Masters (who can send villains into Traps), more new core Skylanders, and existing fan favorites in new poses. As always, each character offers new abilities and will unlock specific content (puzzles, mini-games, activities, etc.) within the game. And the game works with any existing Skylanders toy from Skylanders SWAP Force, Skylanders Giants and Skylanders Spyro's Adventure. Skylanders Trap Team will be out in early October on Xbox One, Xbox 360, Playstation 3 and 4, Nintendo Wii and Wii U plus the Nintendo 3DS. You can pre-order the game right now. The starter pack will include the game, the new Trap Portal, two Traps (Water and Life), two Skylanders figures, sticker sheets, trading cards, and a poster. The retail price is set at $75 and is available for pre-orders on Amazon.